We've got a wren nest in the fuschia plant that hangs in a dogwood tree just off our deck; inexplicably a baby wren got out of the nest today (they're not ready to fledge). I found her on the ground next to our cat, Beth. Normally I wouldn't interfere with baby birds, but this one was just going to be cat food if I didn't do something. It didn't look hurt, but was definitely not happy. So, I scooped up the baby, climbed up on the deck railing and placed it back in the nest with its four other siblings. I then quarantined our outside cats in the garage just to give the wrens some space. I watched the mom and dad wren come and go from the nest and worried they would just kick out the wayward baby. But, I'm happy to report that after an hour I took another peek at the nest and found all five babies arranged safely inside! 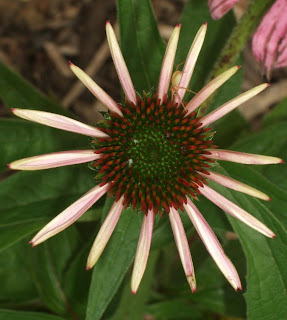 During all this morning activity, I snapped this picture of my Coneflower. This one is just getting ready to open and I couldn't resist with the spider perched on a petal. Echinacea with a spider on the petal. I have been an avid bird watcher my whole life and have had the privilege to see a lot of neat birds in exotic places. Surprisingly though, one of my biggest treats has been found just a few feet off my deck. About two weeks ago, my youngest daughter and I were having lunch on our upper deck. As always, my binoculars were on the table and we were keeping an eye on the bird life around us. By chance, we saw a smallish bird flit by us and land on the maple branch near the railing. It was then we noticed that not only had this bird landed by us, but she had spider webs in her beak and was carefully adding them to a nest. Upon further inspection and a good look at our field guides, we were able to identify our nesting bird as a Red-Eyed Vireo (Vireo olivaceus). 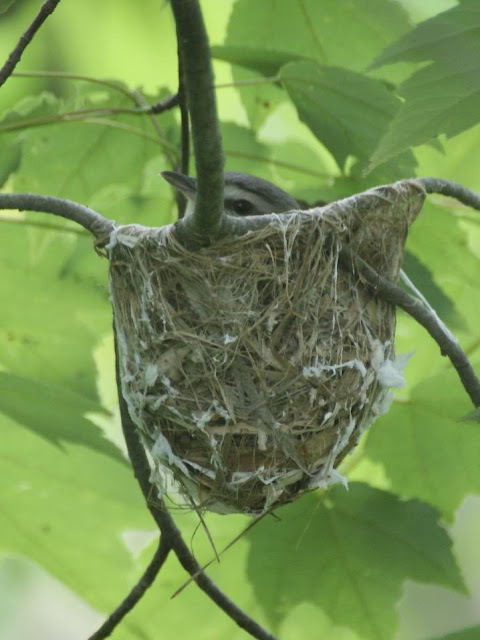 What's even cooler, is the field guides said that many Vireos use spider webs to bind their nests and make them stronger. The female is the nest builder and incubator, but the male can often be seen close by her. You can see the spider webs hanging from her nest. ﻿Now, every time I'm on the deck, I take a peek at our mother Vireo. I keep a close eye out because vireo nests are one of those most frequently parasitized by cowbirds. So far, so good. I'm hoping to get a look at those babies soon! It is with a heavy heart that I write this post. 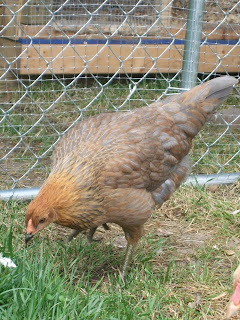 Over the past week, I have lost two of my young chickens. It's funny, with my first flock of 19, I didn't lose any chicks and really didn't have any issues. But, this time around, has definitely been more challenging. The first loss was of my lighter-colored New Hampshire. Just like most of the country, we experienced a highly uncomfortable heat wave. She did not seem to be handling the heat well and kept lagging behind everyone. I made sure everyone had lots of fresh water. I made sure they stayed out all day in the shady spots in my yard. I put the flock into the coop at night only after the sun went down. 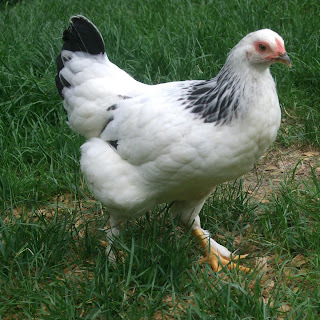 Despite my efforts to keep the chickens cool and comfortable, one morning, I went out to the juvenile coop and there she was, my beautiful New Hampshire was dead on the floor with no obvious wounds. I thought her death was heat related and tried to put on a good face when I told my kids. I also added more roosting poles to the coop so everyone had plenty of room to spread out. My New Hampshire enjoying the sun. What a beautiful Light Brahma...so sweet! ﻿At this point, I was desperate for an answer and figured our coop was cursed. So, I decided we had reached "high noon" and it was time to combine the flocks so the juveniles could spread out in the comfort of our large coop. My husband and I waited until nightfall, added more perches to the big coop, and put the newbies in with our old timers. It was then that it hit me why my two chickens had died. This new flock has the strange habit of huddling together in a tight mass when they are scared. And as we added them to the large coop, they were scared. They huddled together and shoved one of the Ameracaunas against the wall. We had to pull them off each other so she had room to breathe. So, now I know what happened to both chickens. I don't know what scared them when the New Hampshire died, but I do know we had a horrible overnight thunderstorm when the Light Brahma died. In both instances, I think they got scared, huddled and accidentally killed their flockmates. I'm hoping they won't do this again, but I don't know how to break them of this behavior. Maybe the big chickens can help with this. I don't know, but it doesn't seem likely as they're not too fond of their new roommates. As you know, I've been addicted to watching the Decorah Eagles from the first pip in the first egg. It's been amazing to see such devoted parents care for their babies in every type of weather and circumstance. Now the eaglets (E1, E2 & E3 as they are called in numerical order of hatching) are ready to fledge. The folks at the Raptor Resource Project estimate the fledge will occur sometime between June 11th and 25th. They feel it will happen later rather than sooner. So, if you haven't gotten a chance to glimpse this incredible eagle family, make sure to click on the link below. It's cool to see how big they've gotten. There are lots of antics to watch. The eaglets love to practice their flying and sit on the tree branches next to their parents. And, who knows, maybe you'll catch that incredible moment when the eaglets become free of their nest and begin to soar the skies. My kids and I are now obsessed. We have officially fallen in love. With what you ask? A family of five baby striped skunks! On Monday, my sister noticed baby skunks emerging from underneath her backyard shed. They have taken over her yard and are the cutest things ever! You can find them everywhere, from under the deck to the spare mulch pile. In fact, her dog, Tucker, has been relegated to the front yard so he doesn't disturb the babies. They are as small as baby kittens and are still getting their feet under them. They love to play and try to run. But, they're still not that coordinated so they occasionally take a tumble. On Monday, they didn't seem to have great eyesight. By Tuesday, we noticed they can definitely see. In fact the baby pictured below could definitely see me. He or she was busy doing a "get away from me" dance. Normal skunk litters consist of 2 to 10 babies and are born pink-skinned and blind. By their second week, babies are furred and by their third week, their eyes have opened. They are usually weaned and will be out with their mom on nightly hunting forays by their sixth week. So we're thinking these babies are about six weeks old. Although we have never seen the mom, our guess is that she's under the shed and she still lets them suckle since sometimes we can hear nursing sounds. For now, everyone in my family is having fun hanging out in my sister's yard and watching the babies. But the bad news is that the babies normally stay with their mom until the next spring. So, I'm sure things won't be so much fun and may get a little smelly when the babies learn to spray. But until then, it's certainly a privilege to get to observe these smelly little ones! I'll be frank; I'm confused. As you know, we ordered 10 chicks in March. When we were at the hatchery, the helper told us they threw in an extra chick and she identified it as a Speckled Sussex. We were thrilled to have our new little extra! Here comes the rub. One of the babies died in her first week with us. That one was definitely a Speckled Sussex. Now, the chicks are grown up and nobody looks like a Speckled Sussex. I know the identities of everyone else - New Hampshire, Ameracauna, Buff Orpington, Brown Leghorn, Light Brahma and Black Austrolorp. But, I can't figure out the breed for our "extra." She's beautiful and friendly, but what is she? She's a beautiful bird, in fact, I call her "sunburst" because the feathers going down her neck look like rays of sun. 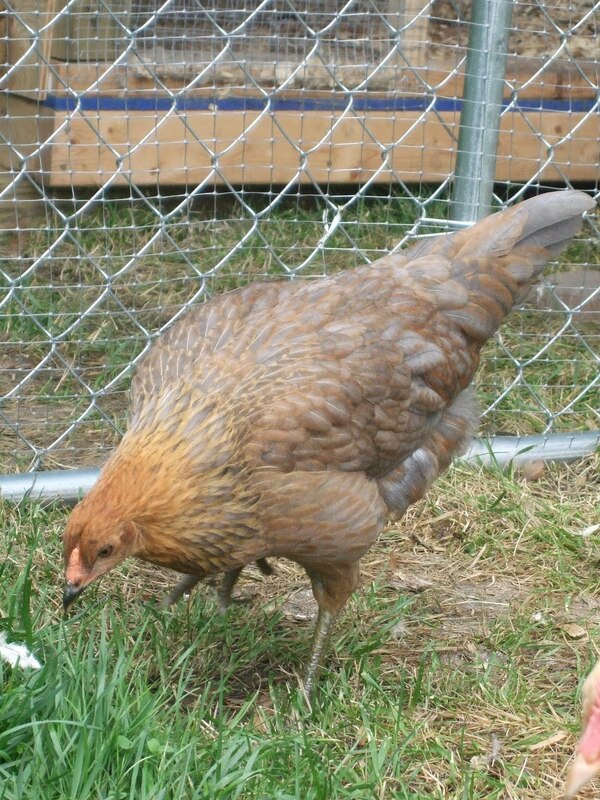 Her golden and orange colors are mixed in with gray feathers and the combination is striking. She's got greenish/brown legs. She looks nothing like the Speckled Sussex that elimination tells us she should be. Sunburst grazing with her flock mates. I lean toward the hatchery worker getting it wrong; with my guess being she's an Ameracuana without the cheek muffs. (One of my last Ameracaunas did not have prominent cheek muffs either.) But, I can't be 100 percent sure. I guess if we have three green/blue eggs in one day, the proverbial proof will be in the pudding. But, what if we don't have that "proof?" I'm intensely curious and wondered if any of you have a guess? I would love to know what you think.